Home / Uncategories / Presidency Lied! Buhari Endorsed The Reinstatement Of AbdulRasheed Maina An Alleged Pension Fraudster, Winifred Oyo Ita. Presidency Lied! Buhari Endorsed The Reinstatement Of AbdulRasheed Maina An Alleged Pension Fraudster, Winifred Oyo Ita. 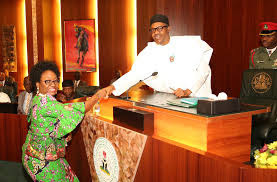 Winifred Oyo-Ita, head of service of the federation, says she warned President Muhammadu Buhari about the reinstatement of Abdulrasheed Maina, ex-chairman of the Pension Reform Task Team (PRTT), into the civil service. Maina, who had been declared wanted by the Economic and Financial Crimes Commission (EFCC) over allegations of fraud, was reinstated into the civil service under controversial circumstances. He was posted to the ministry of interior. In a memo obtained by The Punch Newspaper, Oyo-Ita said she briefed the President on the matter on October 11, informing him of the “wide-ranging implications” of the move. The memo was dated October 23, 2017, and addressed to Abba Kyari, chief of staff to the President. Entitled ‘Re: Abdulrasheed Abdullahi Maina’, the memo was said to have been received by the office of Kyari on the same day. “Please, note that the OHCSF was never in agreement with the reinstatement and consequently never conveyed the approval of the FCPC to Mr. A. A. Maina, nor approved his posting to the Ministry of Interior or any other MDA,” the memo read in part. “Rather, I sought audience with His Excellency, Mr. President on Wednesday, 11th October, 2017 after the FEC meeting where I briefed His Excellency verbally on the wide-ranging implications of the reinstatement of Mr. A. A. Maina, especially the damaging impact on the anti-corruption stance of this administration. “Further to your letter Ref. SH/COS/100/A/1570 dated 23rd October, 2017 on the above subject matter, I write to inform you of the circumstances leading to the irregular recall of Mr. Abdulrasheed Abdullahi Maina. Following the controversy generated by Maina’s reinstatement, President Buhari on October 23 ordered his disengagement from the civil service. Ibrahim Magu, EFCC chairman, on Monday said the people protecting Maina have made it difficult to arrest him.